In this video, watch Linehan demonstrate her approach with an extremely challenging client who manifests significant Axis II issues. This middle-aged man, brilliantly portrayed by Dutch actor Henk Grashuis, is struggling with depression, suicidal ideation, anger, and a sense that he has been treated unfairly by his ex-girlfriend-all of which is hidden behind a brittle defensiveness. 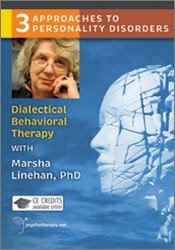 You’ll see Linehan conducting an initial behavioral assessment, interspersed with DBT techniques, including her use of dialectics, irreverence, “validating the valid,” and an emphasis on client choice. While the client works to keep his worst behaviors hidden from Linehan, and is reluctant to commit to any treatment, Linehan carefully, cleverly, and matter-of-factly garners necessary information about him, assesses his suicidality and history of domestic violence, helps him define and commit to his goals, and builds an appropriate initial alliance. You’ll be impressed by how much she accomplishes in a single session! Note: This video is part of a series, Three Approaches to Personality Disorders, in which two other masters-Psychoanalytic Psychotherapy pioneer Otto Kernberg and cognitive therapist Art Freeman-work with the same client. This DVD is licensed for individual viewing only. For teaching, training or institutional use, please call (800) 844-8260 to request a group license. 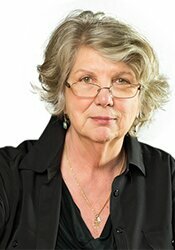 Marsha Linehan, Ph.D., is a Professor of Psychology and adjunct Professor of Psychiatry and Behavioral Sciences at the University of Washington and is Director of the Behavioral Research and Therapy Clinics, a consortium of research projects developing new treatments and evaluating their efficacy for severely disordered and multi-diagnostic and suicidal populations. Her primary research is in the application of behavioral models to suicidal behaviors, drug abuse, and borderline personality disorder. She is also working to develop effective models for transferring science-based treatments to the clinical community. 1.5 Self-Study CE credit is available for an additional fee through the publisher, Psychotherapy.net. Information for obtaining CE is found on the DVD and is approved for Psychologists, Counselors, Marriage & Family Therapists, Social Workers and other mental health professionals.